Two decades ago, I sported an eyebrow ring, much to the chagrin of my family. They hated it! Eventually, I grew tired of their derisive comments, so, I ditched it. A year later, I missed it. Terribly. So, I go the other eyebrow done. Then, I went to work as a paralegal. Even though the dress code was very casual, I still received the unkind comments of fellow paralegals. So, I removed it. The fellow who pierced that one had made the hole in a place that is still sore to the touch. Now, at the tender age of 49 and retired, it's somewhere between difficult, useless and dumb to consider the feelings of those who do not like how we dress, what we do and how we do it. However, these were tough to deal with. Of the five that I received, I was never able to open 2 of them. Two others opened but with some difficulty and one of them was easy to open. It's also difficult to contend with something this small. I put one in my lip, then, one in my nose and was never able to close the rings. Maybe, they don't have to be closed? But, if they aren't closed, will I lose them? 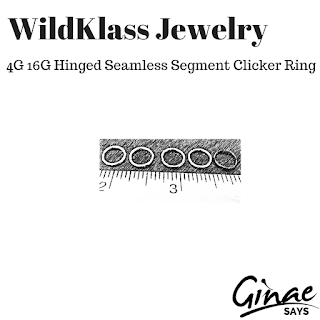 WildKlass Jewelry does sell other sizes. But, I have no idea how big these are. It's just too much of a hassle.